The Other Half is on a decluttering binge, inspired by the fact that he can never find what he is looking for when he is looking for it. I think this is not due to having too much stuff, just not organising the stuff one has in a smart way. Whatever it is, seems like we’re dedicating some serious time this year to decluttering. His decluttering binge has been somewhat interrupted by the arrival of my Aunt and increased hours for me at my work. If my Aunt and I have the day off, we want to go out walking if the weather is good, which it has been. 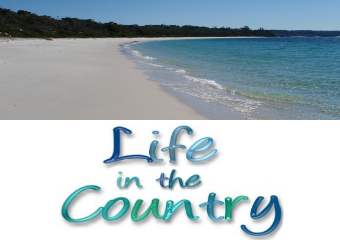 You see at the top of this post a photo of the stunning Jervis Bay on a recent walk we did. But even so we are Getting Shiznit Done here at home. A few rooms of the house have been tackled, but one room needs a LOT of work and that is my Book Room, which also became the dumping ground for anything else that did not have a home. Before I take on this task head on, I need to make some decisions. The Problem – E-books VS Physical Books. 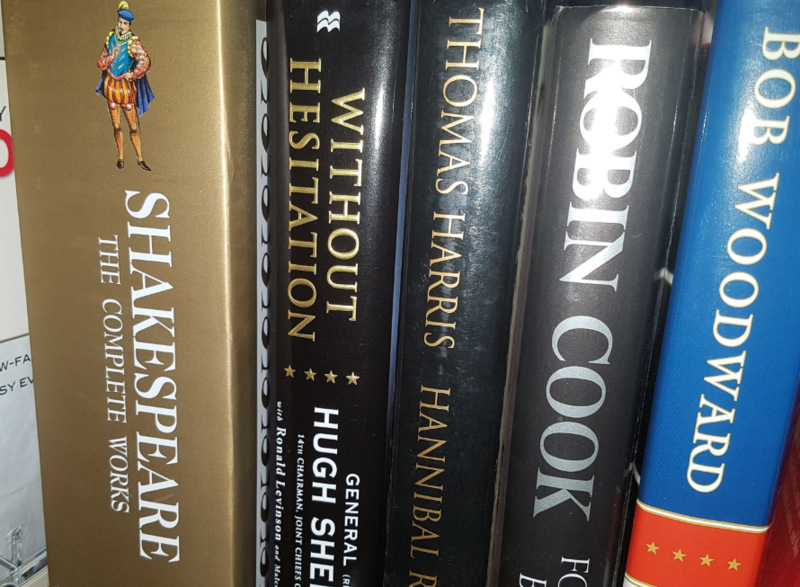 Some of my heavy books – the Shakespeare one is very heavy! I like to read before I go to sleep. I have a lot of physical books. Over 300 at last count, some of which I have owned for 20 years or more. They have travelled from house to house with us as we lived life. They have been good friends, there when I needed them. Which makes the decision to let them go quite difficult and I have never been able to manage it. Sure, sometimes I have done a small book declutter and let books I was no longer interested in reading go. I would always take them to the second hand book store for credit, where I could get secondhand books with that credit. This is really no longer an option I am interested in, because I do not want more second hand books. 1. I don’t have to have a light on when I read because the tablet lights up. 2. No page turning = complete silence so The Other Half can sleep. 3. I can store a lot of books on my tablet and take them everywhere I go. 4. There are a lot of older books available for free via various sites – Project Gutenberg is the one I use most. 5. E-books cannot collect dust or take up room in the house. 6. 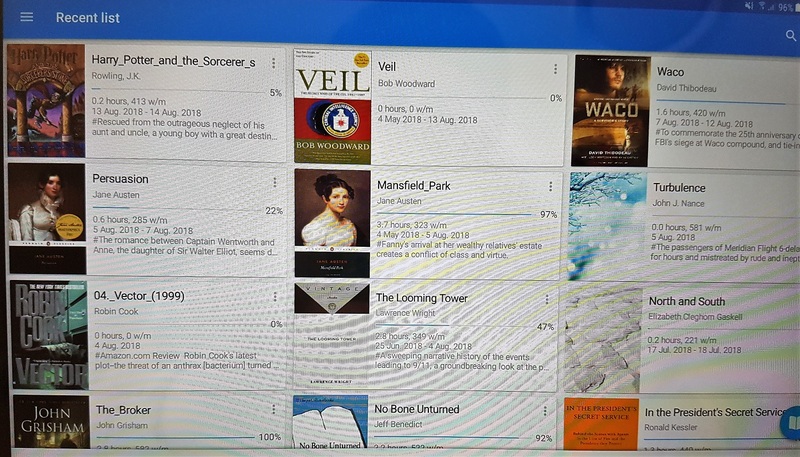 Some e-book readers will keep a record of when you read an e-book, how long you have spent reading it, and it even works out how many words a minute. Mine has the Recent shelf, where it stores the most recent reads in the order I read them – or did not read them, if I was looking for a new read and then decided to look for another book. Those show up with 0 hours in the time spent reading. I know a lot of people have not made this switch to e-books yet, but I am telling you it is awesomeness wrapped up in a nice neat tablet bow. I don’t miss physical books. Especially not on a cold night when I only need one hand available to tap the screen to turn the page. I would read a physical book once every 6 months or so these days, but I mostly read them during the day rather than before bedtime. 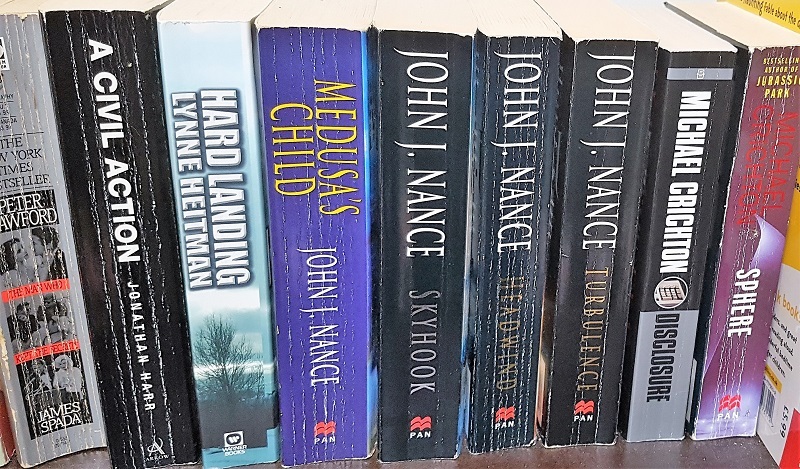 I have collected a lot of e-books over the years and my collection now contains nearly 12,000 books though some of these are the same title just in different formats – epub & mobi mostly. I don’t carry them all on my tablet, I have narrowed that down to a select few, just under 4,000 books there which is nearly 4gb of data. I add in new folders every few months or so. Can you imagine trying to carry 4,000 actual books around? The next logical step in my life is to decide – do I want to keep physical copies of the books I have? If yes, do I want to box them up away from the elements so I could get them out never? If I am doing that, what exactly is the point of that? Would it be better to take some to the second hand book store so they can find new owners who will love them as much as I did/do? Donate some? Try to sell them online? I can use that money to buy digital copies of books. Do I want to try and find digital copies of my entire library? There are some books I have which I would really love to own digitally, especially the very heavy ones. I have been slowly adding these books to my digital collection over time, one author at a time. For example I have a collection of Arthur Hailey books which I want on my tablet. They are available, I just have to buy them. I guess what annoys me about this is, I already own these books. I just need them in the digital format. While I have no problem buying them again, it seems a bit unfair especially when I paid $25-40 for some books I own. I think there should be a scheme of some sort where you pay a lesser cost for the digital book if you already own it, and then you can return the book to the seller so they can sell it as a second hand book. Maybe there is such a scheme, does anyone know of one? If I am going to buy digital copies is it worth joining something like Amazon Prime, do I get a discount if I buy them that way, are there other digital book services I should consider? But then some of my books are not available digitally, so if I want to be able to read them again I will have to have a small bookshelf somewhere in the house. 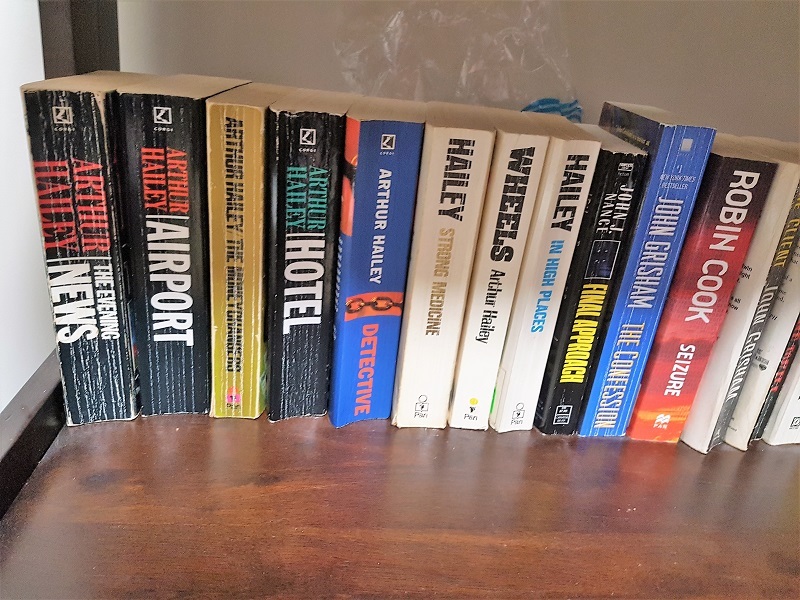 I have a lot of questions without much in the way of answers as yet, so I think I will begin by sorting my books into – books I own digitally, and books I do not own digitally, and then decide what to do with the physical books that I have digitally. I’m using my Timer to set 25 minute sessions, playing some of our great new techno/trance playlist, bopping along cleaning and sorting. I am finding if I do one timer session a day they do add up and I can get a lot done but in small, non-annoying chunks. Before I could even tackle the books I had to clean much junk out of this room and sort through all the Avon and various bits and pieces. I’m now ready to jump head on into this task. Most of these I have in e-book format now. I never thought I would want to let go of my physical books. Ever since I was little books have been a touch stone for me, a way to escape the present and visit other worlds in my mind. However it seems nonsensical to keep so many books when it is unlikely I will ever read them again in that format. The tablet is so much more convenient, I do have multiple backups of these books in case anything happens to the files, and I am feeling ready to say goodbye. We also used to have a huge library. We began to thin out the ranks when we started downsizing around 2009. Paperbacks went immediately. The major downsize came 2 years later with our move to Spain. We probably shipped more books than we needed to, but at least we’re down to only one bookcase! #3 is why I have a kindle, but I no longer carry so many books on it. It lists each book in an index and unless I’m reading from book one to the end, I found myself spending far too much time clicking through 50+ pages of index looking for the one I wanted to read next. Once a book is begun, it remains on the opening page which is handy. But I still love my real books and even though I culled a lot when I moved here, I’ve gradually added a few new ones, most of them by authors I’ve read digitally and know I’ll want to read again and again over the years. I know that someday my kindle will die and I may or may not get a new one, but at least I will have my physical books still. 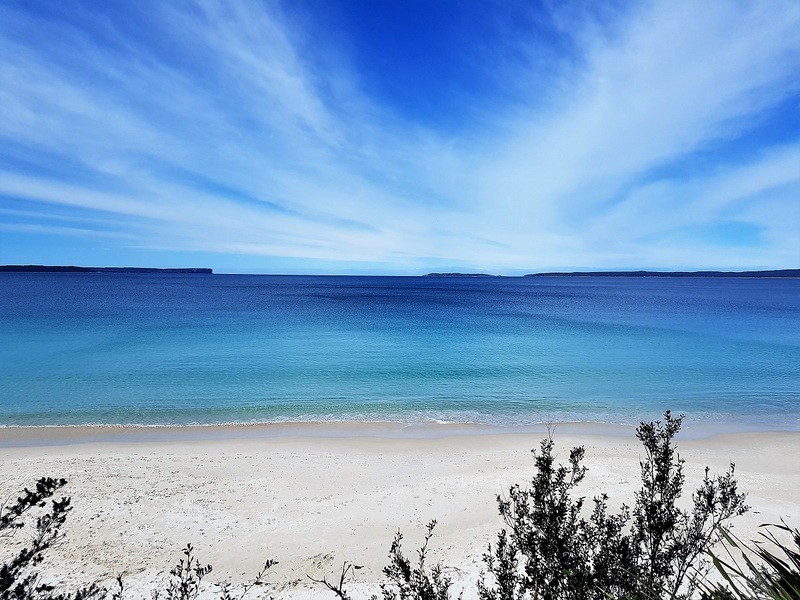 Beautiful photo of the sea and the clouds. 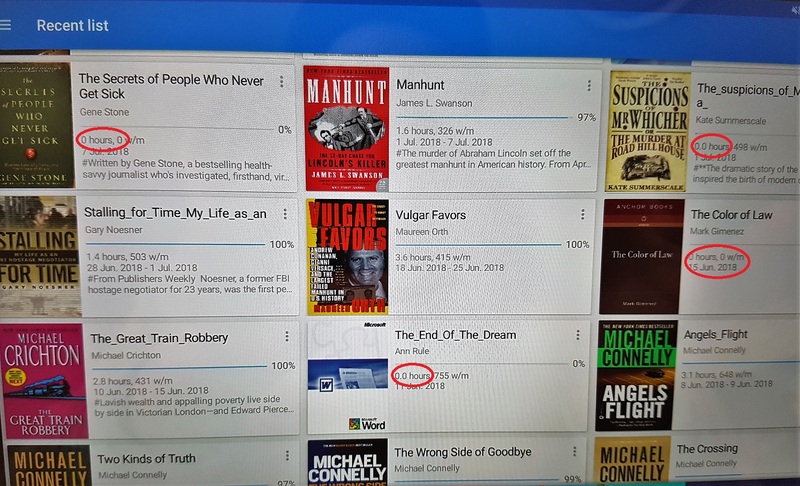 I too have a Kindle and mostly buy very cheap books from Amazon for a couple of dollars, which keeps the books for you to download and read anytime but you can remove them from your device, which I always do. Once I tried to buy a book I had already bought and read and I was alerted to what I was doing. I do read the occasional proper book, usually something short. But as you have found, many older books are not available online…..although what about the site called Gutenberg? I have recently concluded that it is very unlikely that I will now reread books I have read and kept. While we have culled over the years, we have two almost full bookcases and given they are neatly in two bedrooms and sit there nicely, the books can stay. I have one small box of hardcover books that belonged to my father and his mother which will go to someone else one day. What I am most certainly not doing now, is adding any physical books. I’m a retired librarian, and I used to have tons of print books. Every time I moved, I weeded some out, but I like print and holding it and owning it. However, my Kindle changed that. On my last move 3 years ago, I got rid of almost all of my print books after making some hard decisions about which ones I reread enough to add in digital form and yes, paying again for them. But a lot are back-list and reduced price compared with new titles. I kept my genealogy books and have the Book of Life triology by Deborah Harkness in print, as well as the first 35 books of Nora Roberts’ In Death series. And a few religion titles. But really, that’s about it. It’s a shock to me that I don’t miss most of the ones that I passed along. And if I do, I visit a library and borrow it again. The only physical book I’ve added recently is The Dalai Lama’s Cat. I LOVE that Book of Life trilogy.